Is your AC on the fritz? Stop in at Master Muffler’s Downtown Salt Lake location. We know that summers in Salt Lake can be excruciatingly hot. If you’re just relying on the breeze from your rolled-down windows to keep you looking and feeling cool, you’ll be vastly disappointed. 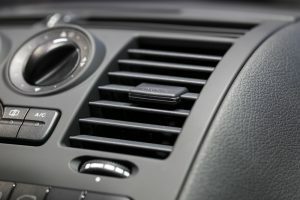 Air conditioning is a unique system inside of your car. Although the air conditioner’s compressor is attached to the engine via the serpentine belt in order to propel the whole system, the rest of it is closed and isolated from the rest of your car’s mechanics. Surprisingly, air conditioners work in the same way just about everywhere; whether you’re looking at a small unit placed in your window, the vents in your car, or a system cooling your whole office building. A refrigerant (in this case, freon R-134A) is compressed and expanded in turn. During the expansion process, the freon quickly changes from liquid to vapour, cooling air which is quickly fanned through the vents. Leaks: One of the biggest hiccups that can happen in your air conditioning system is a leak, since a properly-functioning air conditioner is so dependent on high and low pressure in order to condense and expand the refrigerant. Even a tiny leak will make your system work at a less-than-optimal level. Additives in the refrigerant can help to seal up tiny leaks in the connective hosing. Sometimes, the leaks are due to connective washers and gaskets. Most of the time, a leak somewhere in your car is evident as the liquid drips out. In your A/C system, though, refrigerant will immediately evaporate as it leaks out, odorless and colorless, so finding the breach in the system is much more difficult. Here at Master Muffler, we can use an additive dye in the refrigerant in order to detect where a leak is. Broken Compressor: Often, when your A/C isn’t functioning correctly, it can be traced back to the compressor, since it’s the workhorse of the entire system. On occasion, it’s just a matter of fixing the connection between the compressor and the serpentine belt. Other times, you might need a new compressor to bring your system back to full function. Broken Fans: Fans are located in two places in your air conditioning system: first, to cool down refrigerant in the condenser, and secondly, to circulate cold air from the evaporator into the cabin of the car. Because fans are constantly oscillating, they can be under a lot of stress. Beyond these most-common-problems, an issue with your air conditioning could be traced back to any of the component parts. Here at Master Muffler, we can identify the problem and quickly get it fixed so that you can get back on the open road. Give us a call today if you have more questions, or want to set up a time to bring your vehicle in.